Preparing a sworn statement can be an important aspect of your court case, as it provides evidence that will help in court. Sworn statements can be used in place of in-person testimony as evidence in a court proceeding in some situations. The final word on what can and cannot be presented in court and accepted as evidence is completely up to the judge, however. A sworn statement should provide detailed information that speaks to the truth of a case and is free of opinion or emotion. It does not always need to be notarized, but it is signed under penalty of perjury. 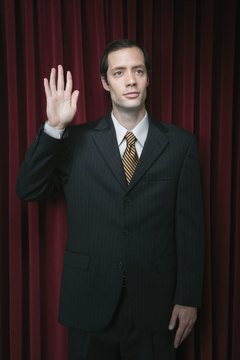 What Is a Sworn Statement? A sworn statement is a legal document that provides your take on facts relevant to a court case. It is different from an affidavit in that it is typically not signed or attested to by a notary public. Affidavits are considered to be stronger evidence than sworn statements due to the fact that they are a notarized legal document. Both documents, however, should present the facts in a straightforward manner. While writing your affidavit or sworn statement, be sure to include all of your personal demographics, such as your address, birth date, legal name (include any nicknames that you go by professionally) and phone number. You will also need to include the case number or the names of the plaintiff and the defendant. This information will only be used in the court proceedings. Provide factual information rather than recollections charged with emotion or opinion. For example, do not say that someone was being unreasonably angry with a cashier. Instead, describe the actions taken during the situation. The person may have yelled, gestured or hit the counter. Those are all factual events and thus belong in your affidavit or sworn statement. If you do need to provide a sworn statement, the endorsement paragraph is an important component. This section of the document, which is usually listed after the statement itself, indicates that you attest that what you say is true and that you know you are under penalty of perjury. Perjury is a crime; it means that you have knowingly and willfully told lied after swearing an oath to provide the truth in court. Sworn statements do not need to be notarized or sealed, but they are legal and binding documents. If a sworn statement is found to be untrue, you could be charged with perjury. Without an endorsement paragraph, it will be considered a statement, and it won't be given the weight that a sworn statement has. The key to a sworn declaration is to include the endorsement paragraph and include something along the lines of “Statement Under Penalty of Perjury.” This shows that you understand that your statement will be handled in court with the same weight as live testimony. There are no length requirements when writing a sworn statement, but you should be sure to provide as much information as possible that is relevant to the case, always speaking honestly and to the fullest extent of your memory. If you are asked to prepare a sworn statement, it is important to know that you are not obligated to do so unless you are subpoenaed. Even if a subpoena is issued, there are a few circumstances that allow you to decline to prepare a statement. For example, if you are not legally competent, such as if your memory of the situation is poor because of cognitive/intellectual disabilities, you may not be compelled to give a sworn statement. If a legally incompetent person does provide a sworn statement, it can easily be attacked by the other side. You may also not be eligible to execute a sworn statement if you have a fiduciary relationship with a party. As you might know, fiduciary is the legal term used when one has an ethical or legal relationship with someone else, often involving money or the management of finances. It means that if you are a doctor, accountant, attorney or relative of the party against whom you are to make the statement, you will likely not be required to testify against her. Additionally, the Fifth Amendment of the Constitution allows you to decline to testify or provide a sworn statement if doing so means that you will incriminate yourself, or if you are the defendant in a criminal case. Smyth, Danielle. "How to Prepare a Sworn Statement." , https://legalbeagle.com/5978132-prepare-sworn-statement.html. 18 March 2019. What is a True-Bill Indictment?